We are a leading Manufacturer of differential gps enhancement service from Noida, India. Differential Global Positioning System (DGPS) is an enhancement to Global Positioning System that provides improved location accuracy. 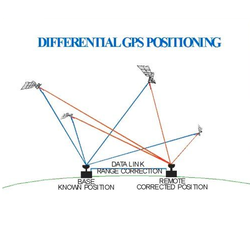 Differential Global Positioning System (DGPS) is a method of providing differential corrections to a Global Positioning System (GPS) receiver in order to improve the accuracy of the navigation solution. DGPS corrections originate from a reference station at a known location. The receivers in these reference stations can estimate errors in the GPS because, unlike the general population of GPS receivers, they have an accurate knowledge of their position.